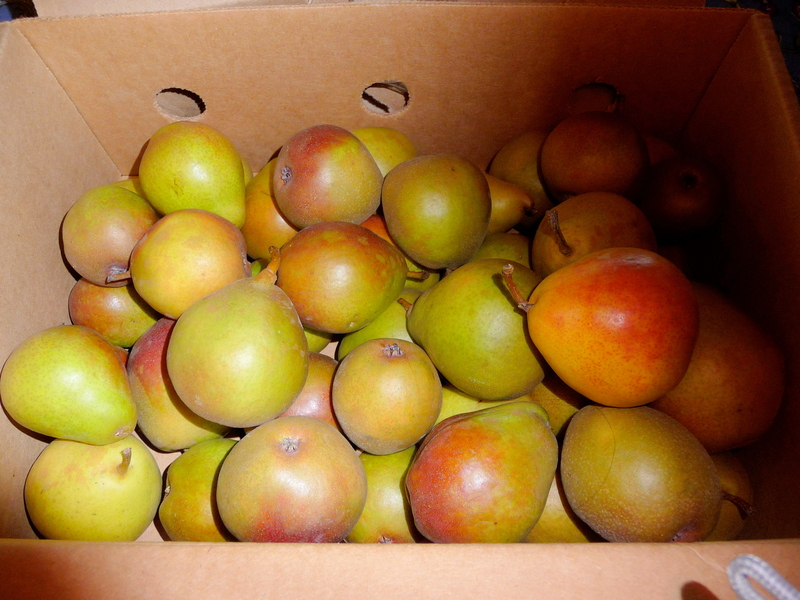 A few weeks ago, a box of pears arrived on my doorstep. My friends, Scott and Maggie McManus, own a pear and apple orchard near Cashmere, Washington, and they’d sent the box as a birthday present. 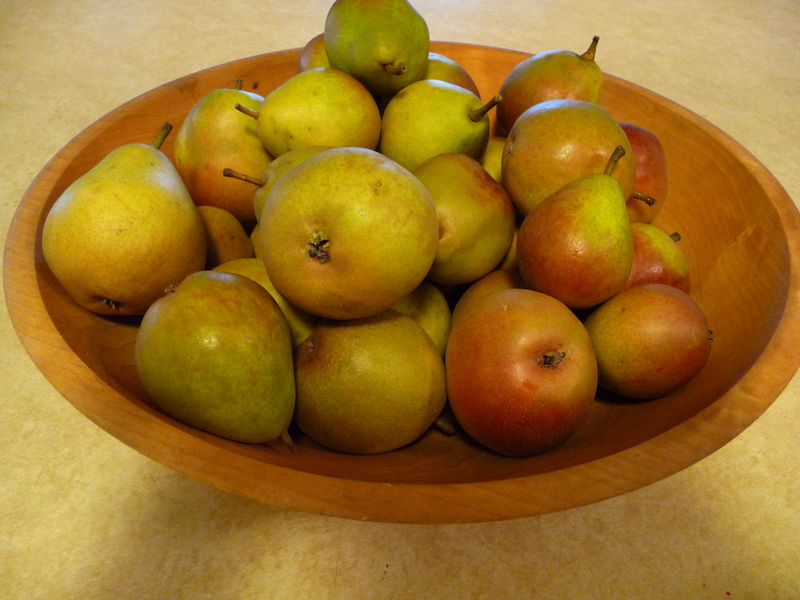 And what a delight it was to have all those delicious little Seckel pears. Seckels are the smallest commercially grown pears and you don’t often see them in the store. 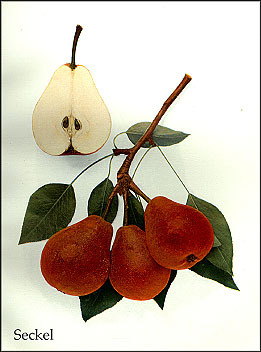 It’s said that a Pennsylvania trapper discovered this type of pear on a seedling tree on a piece of woodland he bought in 1765. 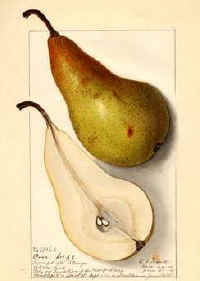 He later sold the land to a farmer named Seckel who introduced the pears to the public. 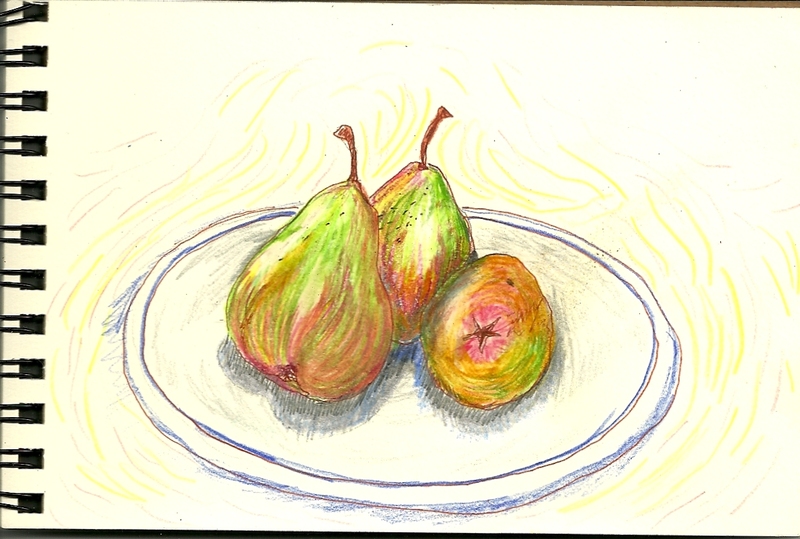 Those pears were inspiring. I tried drawing them, even though my drawing didn’t quite capture the lovely shades of color and light. Since I had so many pears, at first I thought I would use some of them in cooking. But aside from a few that billowed into over-ripeness, I never did. I just ate them (and shared some of them too) as they ripened, sweet, spicy and firm. I ate sliced pears on my morning’s steel-cut oats, added them to a salad with toasted walnuts, served them with cheese and crackers. But mostly, I just plucked them out of the bowl and ate them, one or two at a time for a snack or dessert. Seckel pears are one of more than 5,000 varieties of pears grown in the world. A perfectly ripened pear is a delight to the palate, with a delicate, aromatic flavor and a tender, smooth texture. The pear suggests a European sensibility, a luxuriant, refined appreciation for the finer things in life. But the pear resists ease of enjoyment. As with so many luxuries, the perfectly ripened pear seems always just out of reach, maddeningly elusive. Its ripening habits are confounding: Not only must pears be picked before they are ripe, but the picked fruit ripens from the inside to the outside. When a pear is soft to the touch, it is usually rotten at its core. 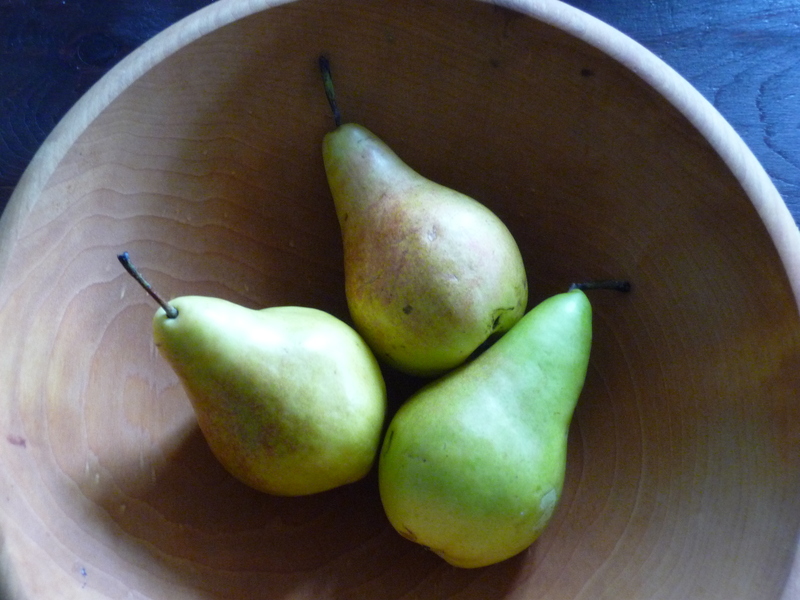 And, except for Bartletts, pears don’t change color to indicate ripeness. A grass-green pear can be ripe – or not. All these ripening quirks have caused many people I know to abandon pears, or nearly so. They’ve cut into hard pears with undeveloped flavor or grainy texture, and they’ve thrown away pears that had gone rotten, their flesh brown and mushy beneath a deceptively unchanging skin. Press a pear gently near the base of the stem; if it yields slightly, it's ripe. 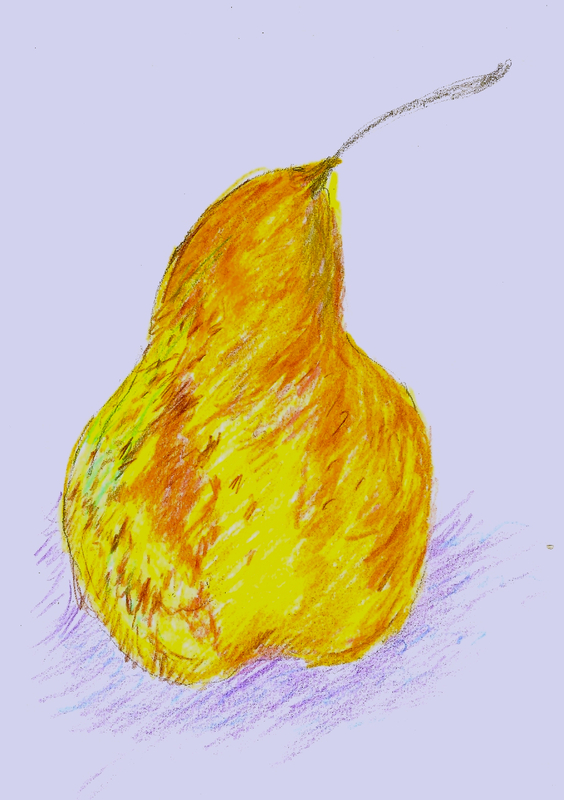 British food writer Jane Grigson contends that “most people have never eaten a decent pear in their lives.” That elusive moment of ripeness is fleeting –hence, an old saying that one must stay awake all night to eat a pear at that perfect moment. But–ah! — when you do catch that ripe moment, it’s a real delight. You can see why Homer called pears “the gift of the gods” and Louix XIV (who loved all sorts of fruits) named the pear as one of his favorites. And that was before pears really became the wonderful fruit we know today. The French learned how to grow pears and peaches on espaliered trees, and in the 18th century, starting with Nicolas Hardenpont in 1730, Belgians bred buttery soft juicy varieties that made pears even more delectable. Belgians developed such an obsession about pears and pear-breeding that it’s been compared to Holland’s tulip craze. Just imagine what a treat it was to eat a sweet juicy pear in mid-winter, in the days before one could buy transported or imported fruit in the grocery store. The holiday season, with all its rich sweets, is a great time to pause and appreciate the fruit’s combined gift of nature and science (fruit breeding)–and to practice the patience and attention needed to produce a perfectly ripe pear. If by chance your pears do over-ripen, cut out any brown portions and put them in your compost; then cook the rest, with a bit of water, down to a tasty puree, with or without spices. Recently, I waited too long to eat some Comice pears, but the pear mash I made from them was delicious. I’ve used such a mash or puree just like applesauce, or added it for a subtly sweet flavor to a butternut-squash soup. You could even keep cooking it until you have pear butter to spread on your toast. 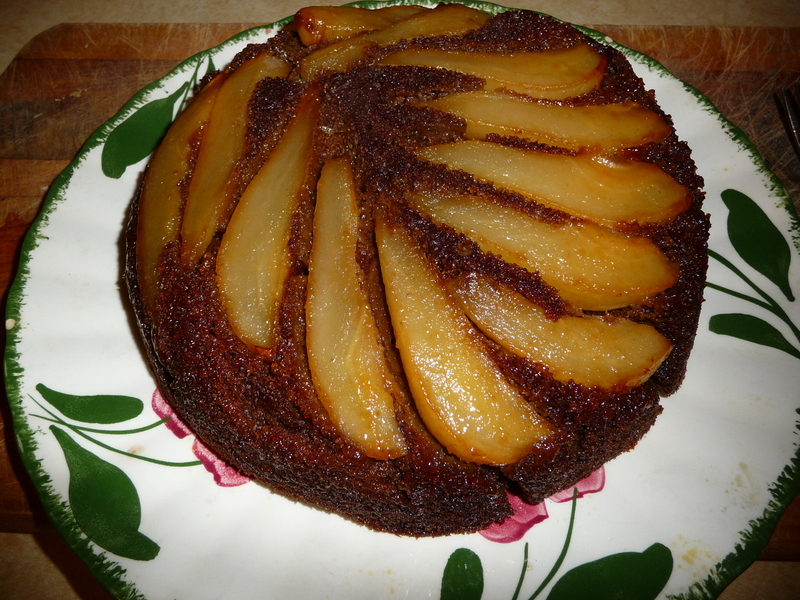 Marcella Hazan has an uncharacteristically simple recipe for a “Farm Wife’s Fresh Pear Tart.” (She says the cake has been described as being “so simple that only an active campaign of sabotage could ruin it.”). It’s a tender fruity cake studded with cloves and it’s quite tasty. Russ Parsons suggests making a pear clafouti with Bartletts, and that sounds good too. 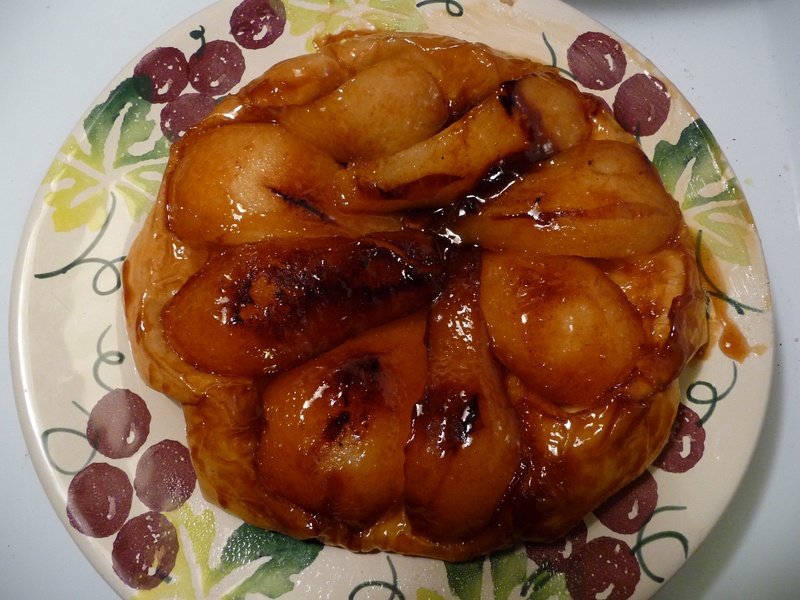 My favorite pear dessert is a pear version of Tarte Tatin: you caramelize the pears in a skillet, lay a puff pastry atop, and pop the skillet in the oven. After baking you turn the skillet upside down so the pastry is on the bottom and the pears are on top. It’s quite delicious and lovely. Firm Bosc pears are best for this as they retain their shape. Cook without stirring until the sugar mixture is a deep golden caramel. This will take from 15-25 minutes. Watch carefully, as the mixture can burn if left on the heat too long. 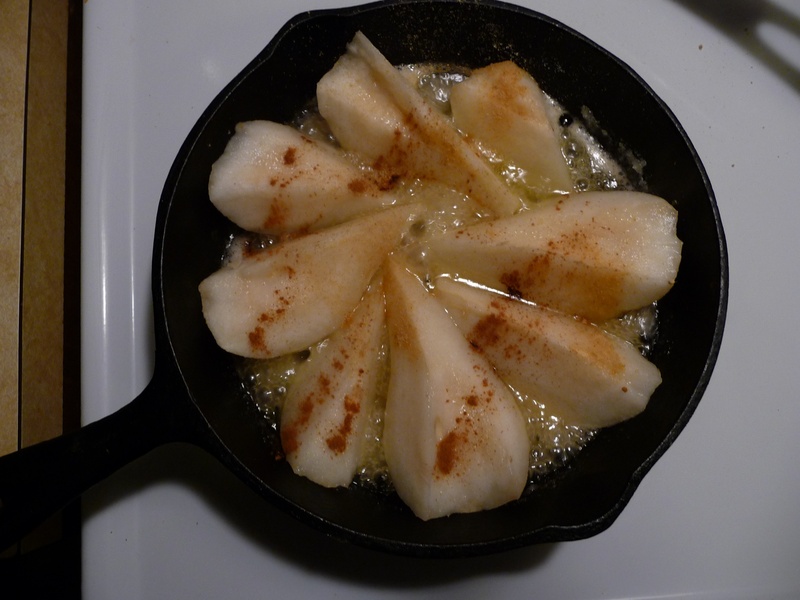 Cool pears completely in skillet. On a lightly floured surface, roll out the puff pastry sheet and trim to form an 11-inch circle. Arrange over the pears, tucking the edges under the pears. Bake in the center of the oven until the pastry is golden brown, about 25 to 30 minutes. 6. While the tart is baking, take out a serving plate slightly larger than the skillet. As soon as the tart has finished baking, and wearing oven mitts, press the plate over the skillet, and immediately invert the plate and skillet, keeping them firmly pressed together. 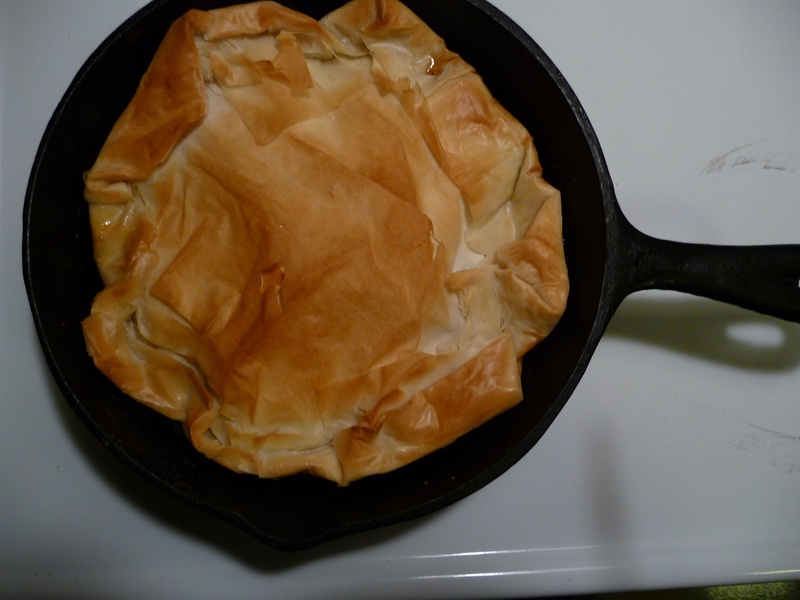 When you lift the skillet, you’ll see a beautiful, glossy tart, with the crust now on the bottom. Serve the tart slightly warm or at room temperature. Granted, it’s a little scary the first time or two that you have to flip the pan over onto the plate or platter (and a cast iron skillet is heavy, though it works great). Don’t worry that the pears will stick to the skillet–they will release from the pan unless you’ve let it cool too long. If any little bit sticks, you can just scrape it out. If the whole idea makes you nervous, you might want to start with making a half version of the recipe, using a small skillet. Using the same method (pouring the cake batter over the pears), I’ve also made gingerbread with caramelized pears. This pear season, though, I haven’t made any of these pear desserts. Instead, I’ve just been contemplating pears, waiting for them to ripen to perfection, and enjoying the look and the taste of them. looks awesome toby! hello from Naivasha! I’m lucky to have had a perfect pear but there doesn’t seem to be an easy way to decide when one is ripe. How did you know when the Seckels were ripe??? Thanks for the post. I inspired to start baking. can’t wait to try some of these recipes..i’ve always loved pear and ginger…. have a great recipe that i forgot about…pear/ginger tiny cakes.mmmmmm! Wonderful pear post, Toby. I’ll have to make a tart with my remaining pears from Scott.